Abichal arrives this morning, knowing that he is locked in a battle with an adversary, that is the bane of many multi day runners, shin splints. It is an insidious opponent who comes and goes mysteriously, and, which no one seems to know a straight forward and effective cure. Last year Pranjal, was plagued with them for 21 days. Abichal has been struggling with them now, for the past 2 days. Rupan tar is cuing up the morning race prayer. He is of course counting down the time to the start, which today seems to be greeted by not much hurriedness, on the parts of the magnificent 14. Ananda Lahari is the other runner who is battling shin splints. While Abichal was only able to run 77 laps yesterday, Ananda Lahari ran one fewer, 76 laps. The morning result sheets can never tell you anything but the truth, sometimes harsh and sometimes glorious. Yet each runner who gazes upon them, can, and must find inspiration to go on. If not a bright, and powerful light, than at least a glimmer that can pull you from the chair and thrill you enough to come back the next day, with a total that will make your steps lighter and firmer on the long road ahead. Yesterdays race prayer is still on the fence. Abichal is getting some assistance from Pradeep, who is counting this morning, and an experienced multiday runner himself. Abichal has asked him, if he can spot any blisters on the bottoms of his feet. He does not see any problems there. Rupantar calls everyone to the starting line, but momentarily gets no takers. Procrastination ends, the moment he plays the morning prayer on his dvd player. That always gets the groups attention. And then they are off. This is Abichal's 6th 3100 mile race. He is the second oldest of the group, at 47. Only Suprabha is older at age 52. 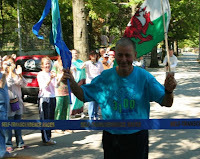 He is from Wales and last year ran a personal best , of 55 days and 8 hours. This was an average, of 56 miles a day and set a UK record for the distance. Yesterday he ran just 42 miles. If you just looked at the numbers on paper, he is in a tight spot. But his spiritual name, Abichal, means unperturbed. As we walk along, he seems calm and determined. He has a knack for performing miracles, when it looks as though it is impossible for him to succeed. He tells me that his first foray into distance running was a European proje ct, in 92, in which students of Sri Chinmoy were asked to run enough miles to match the one million bird paintings he had just drawn. He volunteered to run one thousand miles in honor of the achievement. The project in the end was scrubbed because Sri Chinmoy went on to draw 2 million birds. He, nonetheless fulfilled his commitment, and ran one thousand miles any way. Like some of the other runners, he was first introduced to the longer races in New York by helping at them. Soon he realized clearly enough, "I can either run or help." He started in the longer races, like the 10 day and then moved up to attempt the 1,000 mile race, which he describes as, " a big jump." In 2003, Sri Chinmoy asked for volunteers to increase the number of runners in the 3100 mile race. He says, that he learned with just a week before the race, that he was accepted. He describes, that in that week before the race, he had no idea what he should do to get ready. Once he started, he recalls the race as, "really intense." He says that each time he runs this race it is intense. He says, "the pressure builds. It is really hard, so hard you don't know how to deal with it. There are no reference points." He was not able to complete the distance, because his visa was about to expire. He ran for 56 straight days, and what was so unusual, was that when Sri Chinmoy heard that he was going to stop at 2700 miles, he asked Abichal, "can't you do a few more?" He was thrilled at this request, and so fulfilled it, by running an additional 47 miles. He says that over the years he looks upon his participation in the 3100 mile race as a way of life. It can never be mistaken for anything as trivial as a hobby. "It require all your energy, and application, of all aspects of your being. There are no short cuts." He says that for him, the important qualities he calls upon during the race, are patience, perseverance, and tolerance. He sa ys, that as you are drawn to these qualities you also must let go of things within yourself at the same time. He makes it sound like an emotional, mental, and psychic juggling act. The lessons learned here over the many miles, are also ones in which he feels he is applying in his regular life. He says that there were many obstacles in his way, just to get to the race this year. He tells me he, "pursued all options to get here." When at one point it seemed impossible, he somehow succeeded and arrived in New York the day before the race. He smiles as he quotes Sri Chinmoy, "never give up, this is a job Guru set for us." Parvati's Enthusiasm singers have been singing every day on the course, just as they did when Sri Chinmoy still came to the race every morning. He tells me, that most mornings he sometimes hears just a phrase or even just a word of one of the songs as he runs by, and how much he appreciates it. As we come by them on his 3rd mile of the day Parvati, is about to go home, but he has a chance to thank her. She deeply appreciates that her contribution to the race is appreciated by those who count most, the 14 runners. A little while later, he also comes upon Ananda Lahari, who shows him a new taping technique that he is using on his shin splints. He tried it for the first time this morning and says it is helping to relieve the pain. Abichal says he will try it as well soon. We are passing close by a large pine tree on the edge of the course, near the Grand Central service road. Abichal recounts that he has had many significant experiences out on the course but being near the tree is one of the places on the half mile plus loop that he enjoys the most. He said, he thinks there are places on the course where he can draw energy from, but more importantly he also recalls so many spots on the course where he saw and was inspired by Sri Chinmoy over the years. He says tha t as a student of Sri Chinmoy, "I don't think we realize how close Guru is to us." He tells me that this closeness, is real, and deep, and experienced from within. He says, that despite his physical absence, "I don't feel Guru is gone at all. What he did while in the body he still does. The psychic door is still open. He is right next to us, he is not separated from those who care for him and look to him." I can see that he is looking forward to the long long road, that still lies ahead of him. Realistically he needs to be running 7 1/2 laps every hour he is on the course, and continue this, for the next 40 days. He speaks about the shin splints and says with strength and confidence, "it has to heal." He says of Sri Chinmoy, "He did everything to inspire us." He makes a sweeping gesture at this, that includes not only the runners in front of him and behind him on the course, but also the entire world around them. "This is what we can do as human beings, this is what we need to do." Someone please bring that boy a large strong coffee! Persevere...yes you can do this since it is written so by your soul. The 3100 mile race is a way of life. It can never be mistaken for anything as trivial as a hobby. "It requires all your energy, and application, of all aspects of your being. There are no short cuts." The important qualities called upon during the race, are patience, perseverance, and tolerance. As you are drawn to these qualities you also must let go of things within yourself at the same time. He makes it sound like an emotional, mental, and psychic juggling act. MAY THE JUGGLING CONTINUE! And with a smile. The best to you and all of our 3100runners and support crews!